Posted 4 years ago on Saturday, October 10th, 2015 by Connor T.
I stopped at a gas station one night in my truck and felt a definite crunch as I opened the fuel door. 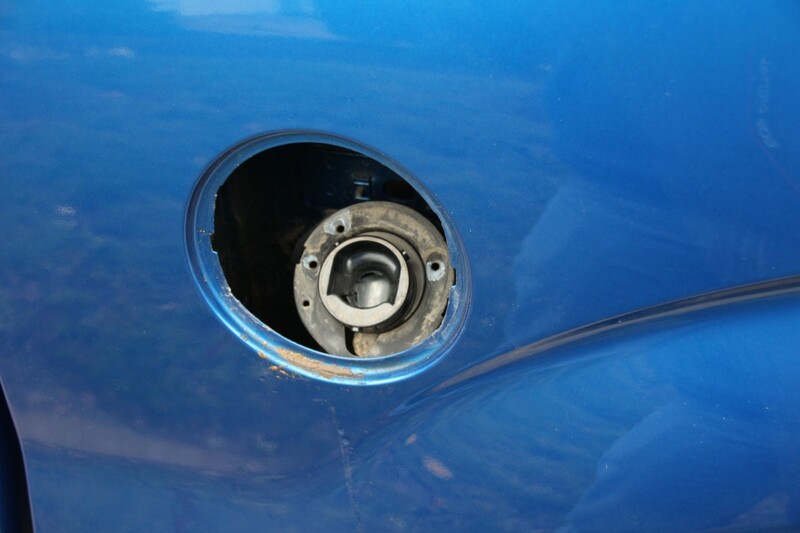 When I finished filling up, the fuel door wouldn’t close, as seen in the picture below, necessitating the fuel door repair. I did a little research online and decided to do a writeup. Most of the threads online I found didn’t have any pictures so I wanted to fulfill that. Start by taking the 3 bolts out right inside the door. 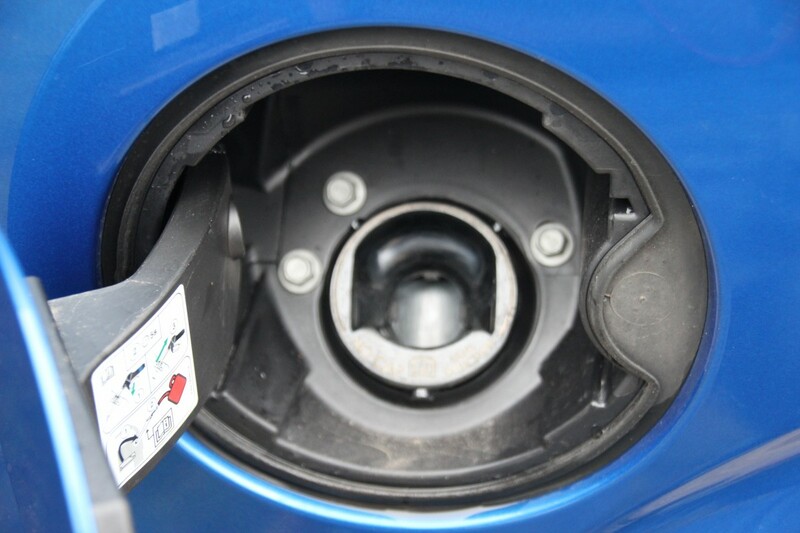 These bolts actually just hold the filler neck to the plastic door housing. The door housing holds itself to the inside of the bed, and it is a PITA to remove. You have to move the filler neck out of the way and reach up and pop the door housing out of the hole int he bed. There are no fasteners, it just pops in or out. You’ll definitely be getting cozy with the back left tire. With the 6.5′ box you may have to improvise because I could still barely reach it on my 5.5′ box, and I’m 6’1″. Once you finally get it, you’ll be left with this. 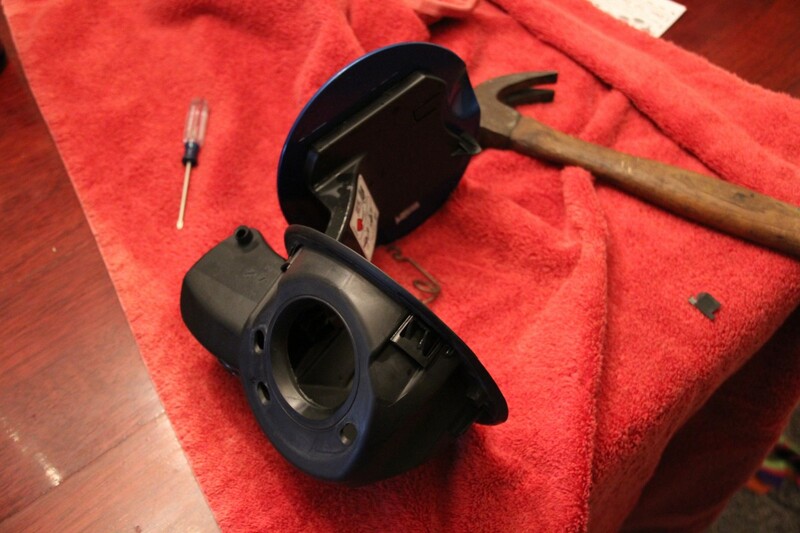 Bring the door housing inside or to your workbench to fix it. The door rides on a plastic hinge pin. The hinge pin has a swing arm which connects to the spring that snaps the door open or shut. 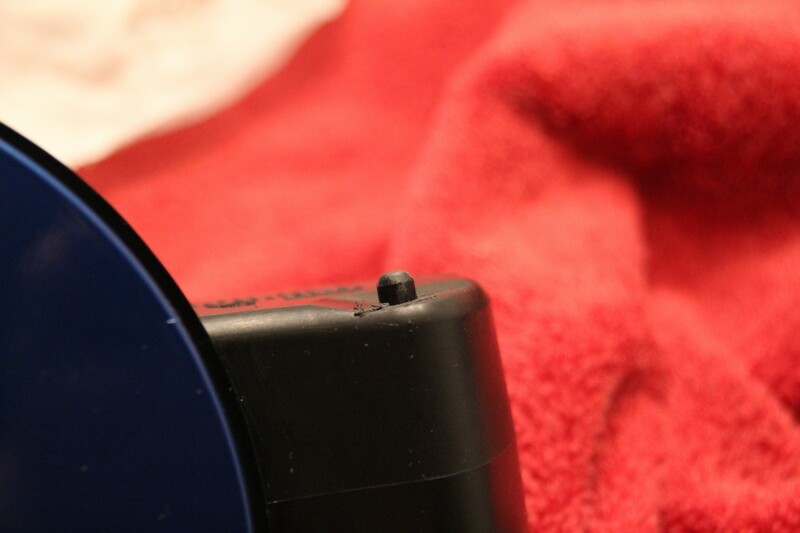 The problem with the design is that, at the bottom of the hinge pin, there is a plastic boss that is supposed to capture the end of the hinge pin, but doesn’t. The hinge pin on my truck eventually worked itself up and out of that boss and became slanted inside the door housing. 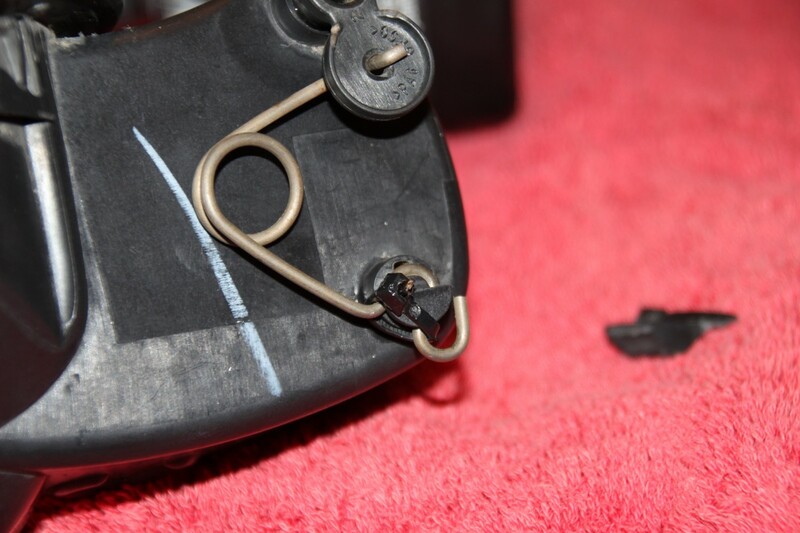 To fix this, essentially, I removed the spring, pulled the hinge pin up and out of the way (not all the way out of the housing), cut the boss off flush with the door housing, drilled a hole in the bottom of the hinge pin, and ran a paper clip through that hole. The paper clip positively locks the hinge pin from ever working its way up and repeating this escapade. 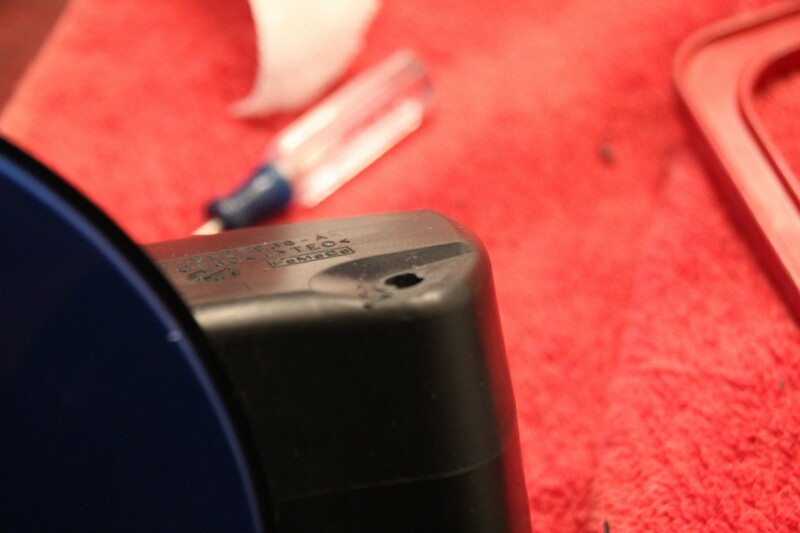 The hardest parts, in my opinion, were removing the door housing from the bed, and indexing the hinge pin so that the spring opens and closes the door correctly. Below are pictures walking you through my process. 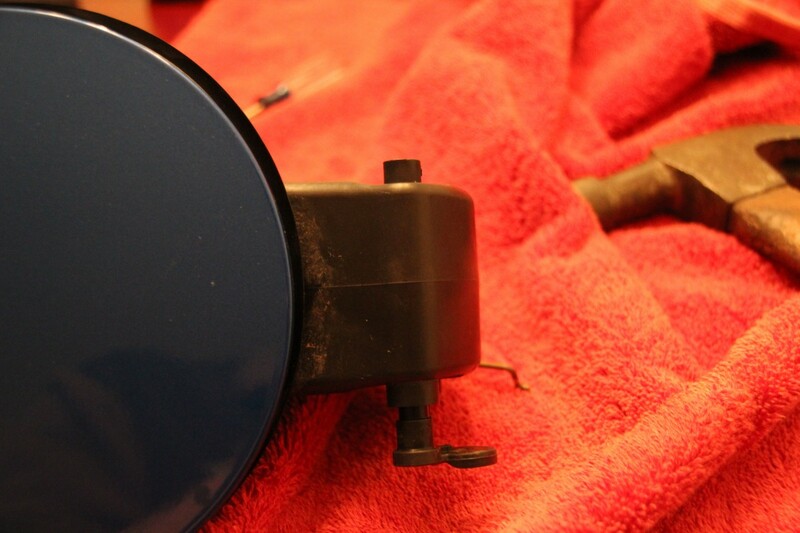 Take a dremel with a cut off wheel and cut the boss flush with the door housing. My cut off wheel wasn’t a large enough diameter to get all of it so I switched to my grinding wheel and finished it off. Don’t worry about the appearance as you will never see this again once its back in, but don’t hack it to death either. 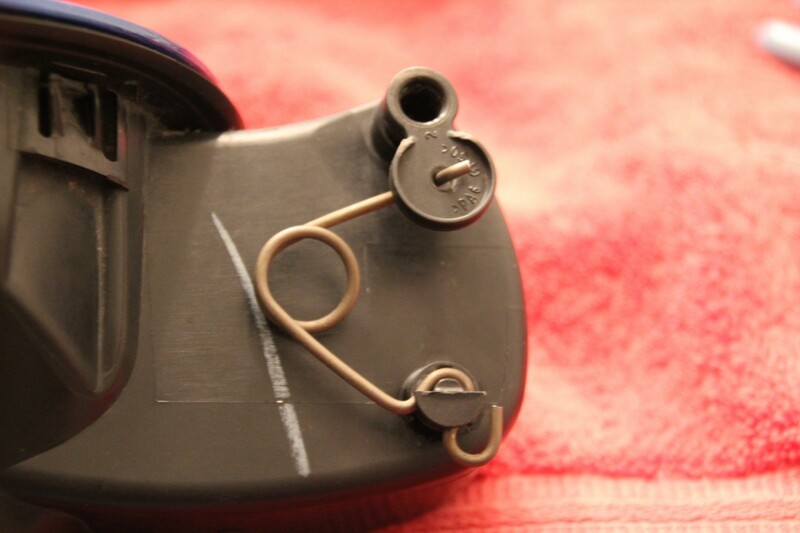 …and run a paper clip through that hole. I twisted both ends so that the paper clip wouldn’t fall out. This may seem like a cheap solution but bear in mind you’ll never see this thing once its back in the truck. This is function over form at its finest! Now the next part is difficult. Take your time with this, and yet, try to get it right in as few steps as possible. I had to twist the hinge pin around to get it indexed properly so that the spring worked right. 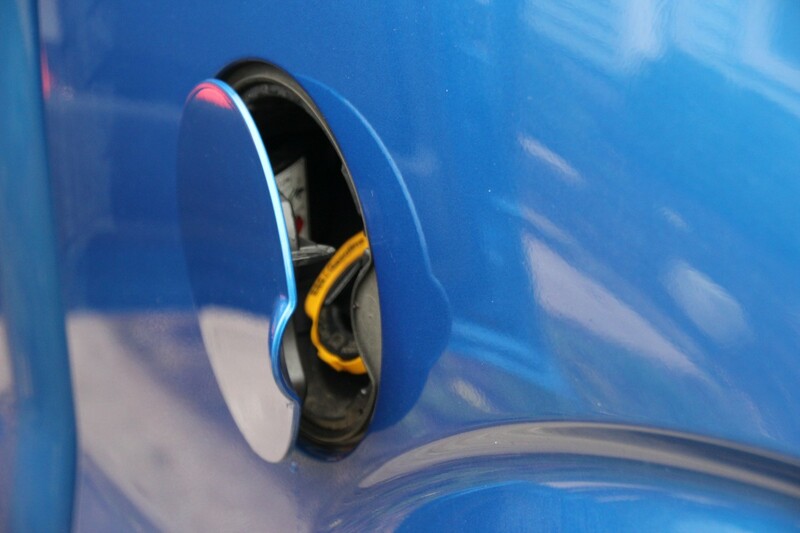 I can only speculate that the shaft of the hinge pin is splined against the fuel door, so that it can positively engage to open and close the door. 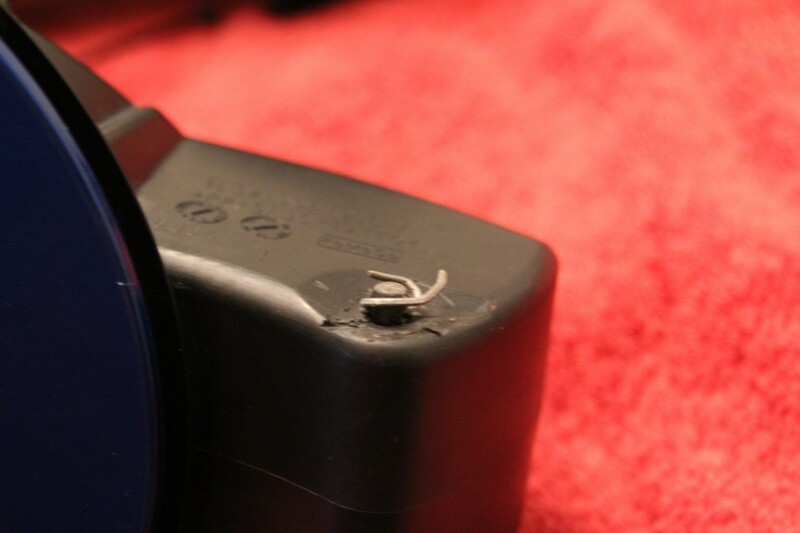 During the failure, my hinge pin skipped a spline and I had to spend some time figuring out how to get it back again. This is the biggest reason I wanted to make a writeup with pictures! I am showing below the proper orientation of the hinge pin to the door housing, and how the spring sits. 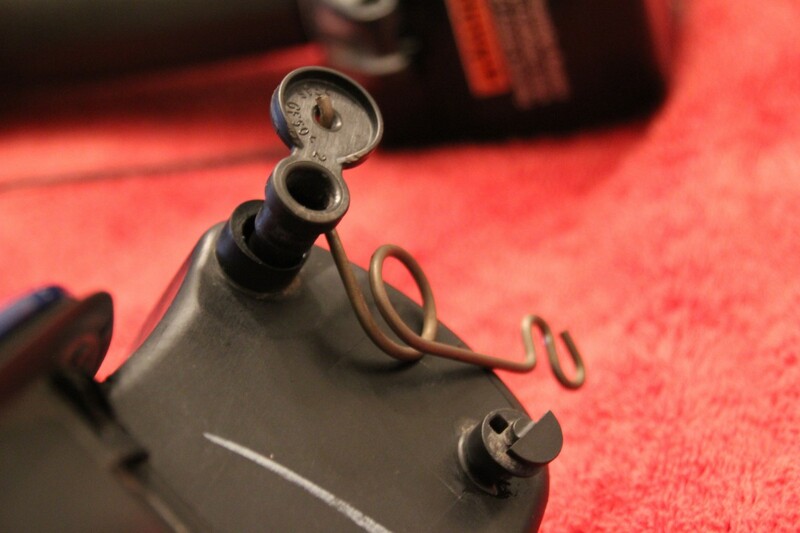 The swingarm needs to point directly at the spring perch for it to work right! I spent so much time twisting my hinge pin and skipping splines that I was beginning to worry that I was wearing my splines down and it wouldn’t work anymore so I stopped while I was ahead, but you could even improve on my pictures here and have your swing arm point directly at the spring perch. This is actually a pretty sensitive alignment, as my fuel door springs open great, but it doesn’t spring close as strongly as it did before the failure. This is entirely due to what I mentioned above. Someone else reading this can skip alot of the guesswork I went through and get it perfect, without rounding off their splines. The swing arm is pointing almost directly at the spring perch, almost being the key word. In a perfect world it would be pointing directly at the spring perch. For good measure I also zip tied the spring tight against the spring perch so it wouldn’t pop off. I dont suspect this would ever be an issue, but I did it anyway. thanks so much you saved my day. Your fix worked perfectly. A cotter pin is a bit better than paper clip.